Spain is one of Europe's most popular walking holiday destinations. With lots of beautiful nature, diverse landscapes, spectacular mountain ranges and a Mediterrenean climate, you can see why so many people love walking in Spain. Here you can read more about Spain in general and about walking in Spain in particular. Are you looking for a walking holiday in Spain? Have a look at our selection of Walking holidays in Spain. Mainland Spain is dominated by the Meseta Central, a region of high plateaus and mountain ranges. Other landforms include narrow coastal plains and lowland river valleys, such as Andalucia in the south west, where many people go walking. The highest peak on mainland Spain, the Mulhacén, is found in the Sierra Nevada mountain range, another popular walking destination in Spain. In the north of the country you find the high peaks of the Pyrenees and the Picos de Europa. Picos de Europa literally means "peaks of Europe". The most widely accepted origin for the area's name is that they were the first sight of Europe for ships arriving from the Americas. Almost all of the rock in the Picos de Europa is limestone, and glaciers have created an impressive area of alpine karst here. 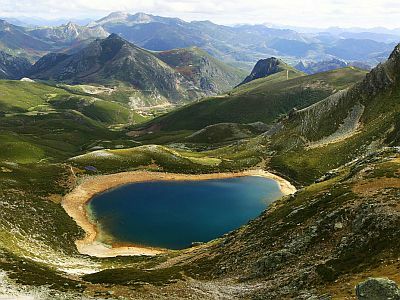 With it's beautiful scenery and varied wildlife, Picos de Europa is one of Spain's most attractive walking areas. 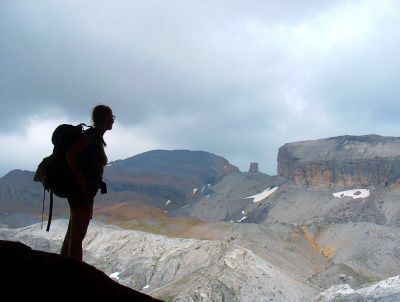 Another popular walking holiday destination are the Pyrenees. This mountain range forms a solid barrier and natural border between Spain and France that has effectively isolated the countries from each other. In several places, peaks rise above 3000 m.
Both the Canary islands and the Balearic islands are part of Spain. If you want to combine walking with other holiday activities, these might be for you. The Canary island group is located just north-west off the coast of Africa, and consists of seven islands, of which the most well known are Tenerife, Gran Canaria, La Palma and Lanzarote. Spain's highest mountain, the Teide, is found on Tenerife. The Balearic islands are found in the Mediterranean sea with most well known being Mallorca (also spelled Majorca) and Ibiza. Most of Spain has a Mediterranean climate with two rainy seasons (spring and autum) and warm and cloudless summers. The north-west, including the Pyrenees and Picos de Europa, have an oceanic climate with more rainfall. 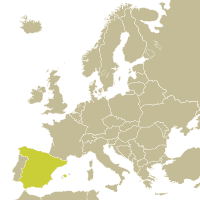 These areas are also known as "green Spain". High in the mountains there is of course a mountain climate, where you can also go snow-walking. The Canary islands fall within the subtropical climate zone. Together with southern Spain they can be a very good winter walking destination. If you like walking through beautiful nature, you'll love walking in Spain. With its diverse landscapes and many areas of high nature value, Spain is a wonderful walking holiday destination. Landscapes vary from high mountains, to plains. In the plains there are extensive prairies, but there are also important wetlands in Spain. And on the Canary Islands you'll find impressive volcanic landscapes. Walking route in the Picos de Europa, in northern Spain. There are 14 National Parks in Spain, of which the most well-known are Sierra Nevada National Park, Picos de Europa National Park and Teide National Park. Teide National Park is found on Tenerife, on the Canary Islands and boasts the third largest volcano (dormant) in the world and beautiful volcanic landscapes. It's the most visited national park in Spain and Europe, and even worldwide it comes second. With so much variety Spain is a very popular walking holiday destination in Europe. Each year many people walk through Spain's diverse landscapes and enjoy quiet nature, dramatic scenery and the mild Mediterranean climate. The best time for a walking holiday in Spain is generally spring (May and June), when the landscape is in full bloom, or autumn (September), when you can enjoy superb walking weather and changing colours. April and October are also good months for walking in southern Spain. And some higher mountain areas also offer great summer walking. The small scale holiday providers listed on this website have a wealth of local knowledge. They will be happy to give you advice on the best timing for a walking holiday in Spain.